Several businesses in the Burren and Cliffs of Moher Geopark, all members of the Burren ecotourism network are offering free cups of tea to anyone who arrives to their business on a bike. 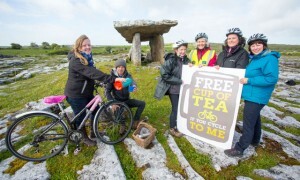 Developed by the Burren & Cliffs of Moher Geopark and An Taisce Green Schools Travel officer Roisin Garvey, in conjunction with the Burren Ecotourism Network, the ‘Free cup of tea if you cycle to me’ scheme will see cyclists offered a free cup of tea when cycling to participating businesses. Irish Champion pro-surfer Fergal Smith, himself a keen cyclist, launched the initiative with members of the Burren Ecotourism Network at Poulnabrone Dolmen in the heart of the Burren on Tuesday, June 2nd. “Our aim is to raise the profile of the Burren and Geopark as a cycling destination. Burren Ecotourism Network members are already promoting cycling in the Geopark by offering various discounts for persons arriving by bike or on foot but this initiative represents more of coordinated effort,” Carol Gleeson, Project Manager, Burren and Cliffs of Moher Geopark.